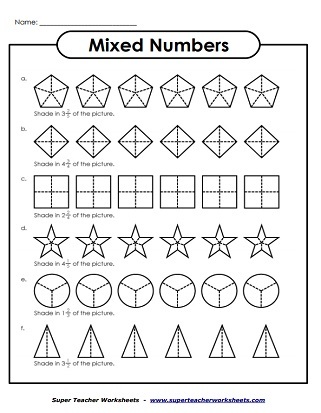 This is a collection of mixed number worksheets, which includes adding and subtracting mixed numbers. Students write the mixed number shown by each illustration. Students color the sets of shapes to show a mixed number. Write a mixed number for each tasty treat illustration. Write a mixed number to show the amount of pizza. Place the mixed number cards in order from least to greatest. Place the mixed numbers in order on the number line. Then use comparing symbols to determine the greater number. Convert each mixed number into an improper fraction and vice-versa. There's also a word problem on this page. Write the correct mixed number and improper fraction for each illustration. Write improper fractions as mixed numbers, and vice-versa. This set includes 30 task cards and an answer sheet. Use these cards for learning centers, small group instruction, classroom games, exit slips, or scavenger hunts. Cut out each improper fraction and glue it next to the correct mixed number. This version has denominators equal to 5 or less. 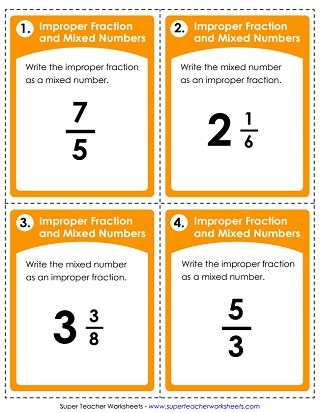 Cut out each mixed number and glue it next to the correct improper fraction. This version is harder, with denominators up to 12. A dozen mixed number addition problems. Denominators are the same. Add the mixed numbers with different denominators. This page has vertical problems and there are no improper fractions in the addends or the answers. Add the mixed numbers with different denominators. Most sums have improper fractions. Some addends are improper as well. Subtract the mixed numbers with different denominators. This page has worksheets for teaching basic fraction skills, equivalent fractions, simplifying fractions, and ordering fractions. There are also links to fraction and mixed number addition, subtraction, multiplication, and division. Add fractions with same and different denominators; Also add mixed numbers.